Through much of England’s turbulent history, Walworth Castle has remained standing. Indeed, it has had to endure many trials of its own. With origins dating back to the 12th Century, the building has been owned by several notable families but almost feel into ruin during the 1500‘s - the east and west wings were both rebuilt during the reign of Elizabeth I. Although the castle has played host to numerous dignitaries during its history, the most notable guest to take respite within its safe walls was King James I - the man who would later be targeted in the infamous Gunpowder Plot. Arriving on the 14th of May 1603 while en route to London for his coronation, it is widely believed that his stay was so agreeable he rewarded the then owner, Elizabeth Jenison, by knighting her son-in-law. By the end of the seventeenth century, however, Walworth was somewhat less popular with the monarchy - in 1689 the Papist castle was scoured for weaponry among fears of a rebellion against King William and Queen Mary. 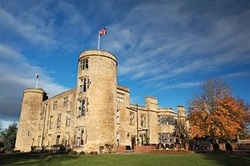 In more recent times the building served as the military headquarters for the Durham Light Infantry during World War II, and later as a school for girls.